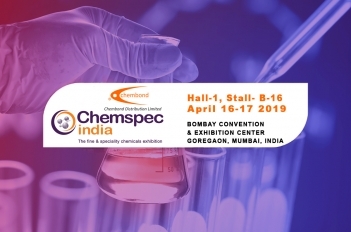 Chembond Distribution Limited to participate in Chemspec India 2019 - The Fine & Specialty Chemicals Exhibition. Chemspec India 2019 has a special focus on Water & Waste Water Treatment. Chembond cordially invites you to visit our Stall no. B16, Hall - 1 which takes place from 16-17 April 2019 at the Bombay Exhibition Centre, Mumbai.